I am ready for Fall! I have been impatiently waiting for awhile. It felt like Fall to us here yesterday morning. At 11 am it was only 83! Some of you may laugh, but compared to the 95 we have been having it feels much cooler! I wanted to make something that tasted like Fall and my Pumpkin Cookie recipe was just the thing! Note post was from last year…no Pumpkin Shortage this year! 🙂 Yay! Now of all the bizarre things for there to be a shortage of, Pumpkin is in short supply this year. There was bad weather during last year’s crop that ruined about 1/3 of the crop…resulting in the shortage on grocery shelves today. Lots of people are reporting difficulty finding this precious commodity and NECESSITY in their stores. I am not trying to panic you. I am just saying if you see a can, buy it. My Publix was out of canned pumpkin, but Walmart had plenty. So that is where I bough 6 cans. I wanted to make sure I had enough for my Pumpkin Cookies, Pumpkin Muffins, and Pumpkin Pie. Can you tell I love Pumpkin?! Anyway, I am now stocked up for whatever shortage comes my way. So with out further delay. Combine Flour, Baking powder, Baking soda, Pumpkin Pie Spice, and salt; set aside. In a medium bowl, cream together the ½ cup of butter and sugar. Add pumpkin, egg, and vanilla to butter mixture and beat until creamy. Drop on cookie sheet by tablespoonfuls. Bake for 11-15 minutes in the preheated oven. Dip warm cookies in glaze and allow to cool. Combine 2 cups powdered sugar, 3 tbsp milk, 1 TBSP melted butter, and 1 tsp vanilla. Add milk as needed to achieve the right consistency. You can also drizzle the glaze on the cookies instead of dipping if you prefer. You could mix in chocolate chips or raisins into the batter before you bake. I haven’t tried it myself, but I bet they would be yummy! Dairy Free: Use Butter Flavored Crisco instead of butter. When making the glaze use vanilla soy milk, and dairy free margarine. I hope you enjoy these great fall recipe! Let me know how they turn out! By the way, this handy little gadget is a life saver when making cookies! I love mine and wouldn’t be caught without one! I am a firm believer that every baker needs a cookie scoop! those look wonderful!! I bet a maple glaze would be delicious. I’m guessing the pumpkin crop was better this year because I’ve seen a LOT of fresh pie pumpkins in the last week. So if you run out of cans, you can cook up a fresh pumpkin! Your cookies look so good, especially with that glaze. Thank goodness there are cans of pumpkin in my grocery store here. 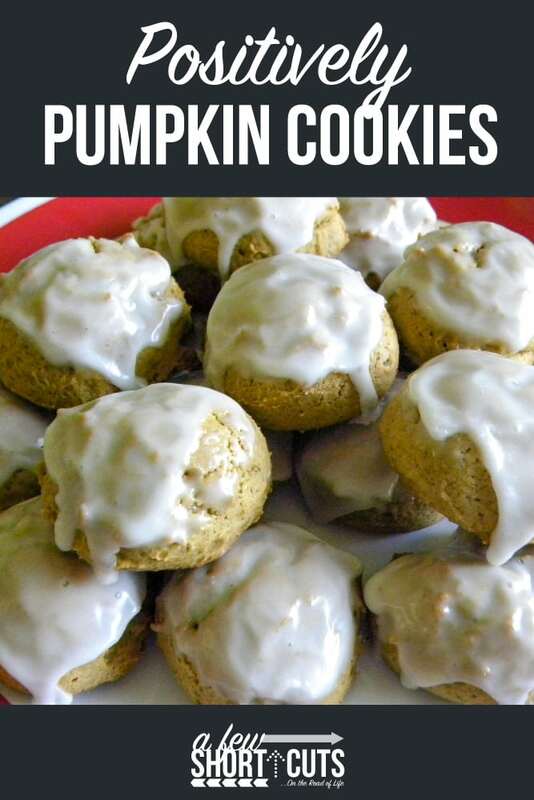 I had something like these cookies at a tailgate over the weekend – the girl took one can of pumpkin and mixed with a spice cake mix – no eggs,no oil, nothing else. The cookies were delicious, and a great way to make a sweet when you are out of eggs! She frosted them with cream cheese frosting.